How much RAM does your system have? A top-of-the-line workstation PC may have 32GB, and a cutting-edge PC may have 64GB. The average workstation today is closer to 8GB, while an old laptop may only have 2GB or less. None of these come close to 1TB! Ten years ago, you’d be well off with 128GB of storage. Today, hard drives are pushing limits of 24TB and beyond. Will we see that pace of growth in RAM as well? Maybe, maybe not. But it’s interesting to think about, isn’t it? Let’s consider what we could do with 1TB of RAM. What Does 1TB of RAM Look Like? What you’re seeing is a server with 16 memory banks, each one outfitted with 3 memory modules: a 1 x 32GB stick and 2 x 16GB sticks. That means 64GB per bank, which comes out to 16 x 64GB = 1,024GB of total RAM. This image is actually a few years old, and servers with 1TB of RAM are increasingly more commonplace these days. How much would a system like this cost? It’s hard to say because most 16GB and 32GB RAM sticks are made for server specifications and can’t be used in regular desktop systems. But for comparison’s sake, Amazon has a Crucial 16GB Single DDR4 Module on sale, and you’d need 64 of them to reach 1TB of RAM. The total cost would come in just shy of $10,000. But even if you could afford it, desktop systems have limited RAM slots in the motherboard: an average motherboard may have two or four slots, and more expensive ones may have eight slots. Server motherboards can go up to 16 slots (anything more is enterprise-grade). So as of this writing, assuming a maximum of 16GB per stick and a motherboard with eight slots, the practical upper limit for desktop memory is around 128GB. We’re still many years away from having 1TB of RAM at home. But let’s ignore that and have some fun anyway. The good news (for us) is that RAM has diminishing returns: at a certain point, adding more RAM to a system doesn’t provide much extra value. Most computer apps don’t use much RAM at all, so as long as you have enough for day-to-day activities How Much RAM Do You Really Need? How Much RAM Do You Really Need? RAM is like short term memory. The more you multitask, the more you need. Find out how much your computer has, how to get the most out of it, or how to get more. Read More , you should be fine. But if you had way more RAM than necessary, here are some things you could do. With 1 TB of RAM, you may finally be able to open more than 10 Chrome tabs! Jokes aside, there are reasons why Chrome and other browsers hog so much memory. When we compared Firefox and Chrome 7 Reasons to Switch From Google Chrome to Mozilla Firefox 7 Reasons to Switch From Google Chrome to Mozilla Firefox Google Chrome is the most popular web browser, but is it right for you? Here's why you might prefer Mozilla Firefox. Read More , we found that 15 tabs (all pointing to MakeUseOf’s homepage) required ~520MB of RAM in Firefox and ~750MB of RAM in Chrome. And our site is far from the most memory-intensive site on the web. If your tabs are pointed to games, interactive media, social media, etc. then you can expect each tab to hog much more. But with 1TB of RAM, who cares? You can open thousands of tabs without batting an eye. How awesome would that be? With smart tab management tactics, it wouldn’t even bog you down. When you stream videos on the web, the browser has to download the first few seconds before it can start playing. Then, during playback, it keeps downloading more and more of the video as a “buffer” in case your internet momentarily chokes up. Buffering helps prevent stuttering. But all that video data needs to be readily accessible, so buffered videos are stored in RAM. If you run out of RAM, it gets stored in virtual RAM: a section of your hard drive that’s set aside as an overflow area when physical RAM space runs out. With 1TB of RAM, you could buffer dozens or even hundreds of videos (e.g. YouTube, Vimeo, DailyMotion, etc.) ahead of time to play at your leisure. Normally this is a bad idea because loading data from virtual RAM to physical RAM is slow, but if you have 1TB of RAM, this won’t ever be a problem for you. Modern PC games load all kinds of data into RAM when starting up: textures, models, music, sounds, etc. Startup can be a slow process, though, because all that data needs to be loaded from your hard drive. That’s why it can take a minute (or even longer!) to launch games. With 1TB of RAM, you could launch every single game on your system and never close them. The data would stay loaded in RAM and you could switch between games whenever you want. Even if you took a break and weren’t playing anything, you could keep them open. They’d be instantly available when you got back in the mood. This also applies to other memory-intensive apps: digital audio workstations, video editing suites, high-resolution photo editing software, etc. Leave them all open all the time! Did you know you can run operating systems within operating systems? I literally mean, for example, running macOS in a window on a Windows PC How to Run macOS on Windows 10 in a Virtual Machine How to Run macOS on Windows 10 in a Virtual Machine The best way to try a new operating system is with a virtual machine installed on your existing OS. Here's how to run macOS Sierra on Windows 10 (i.e. create a virtual Hackintosh). Read More . Or you can run Windows within Windows, or Windows within Linux. These so-called virtual machines are possible through the magic of emulation and virtualization. There are many reasons to use virtual machines 7 Practical Reasons to Start Using a Virtual Machine 7 Practical Reasons to Start Using a Virtual Machine The term "virtual" has been co-opted in so many ways. Virtual reality. Virtual RAM. Virtual schools. But Virtualization in the context of PCs can be confusing. We're here to clear it up. Read More , such as testing out a new operating system Testing A New Operating System? Stay Secure With A Virtual Machine Testing A New Operating System? Stay Secure With A Virtual Machine Read More inside a secure sandbox. You mainly do this using either VirtualBox or VMware Player (see our comparison of the two VirtualBox vs. VMware Player: The Best Virtual Machine for Windows VirtualBox vs. VMware Player: The Best Virtual Machine for Windows Are you struggling to decide which virtual machine software to use? VirtualBox and VMware Workstation Player are both free. But which one is best for you? Let us help you find out! Read More ). But the problem with virtual machines? Each instance uses up a portion of your system’s resources, and RAM is one of the most limiting factors when running several virtual machines. With 1TB of RAM, it’s no longer a concern. That much RAM lets you spin up dozens of instances without impacting overall system performance. A RAM disk, or RAM drive, is exactly what it sounds like: a virtual drive on your system that uses a portion of your RAM for storing data. Setting up a RAM disk is as easy as installing SoftPerfect RAMDisk on Windows (or equivalent software for Mac or Linux). RAM disks are great because RAM modules are blazingly fast. Whereas a modern HDD can transfer data up to 120MB/s and an SSD can transfer data up to 550MB/s, RAM modules can go up to 6.4GB/s — more than 11x faster than SSDs! The RAM you set aside for the disk becomes unavailable for normal RAM use, but if you had 1TB of it, that wouldn’t be an issue at all. However, RAM disks do have a couple of other downsides, which you can learn more about in our overview of RAM disks Are RAM Drives Faster Than SSDs? 5 Things You Must Know Are RAM Drives Faster Than SSDs? 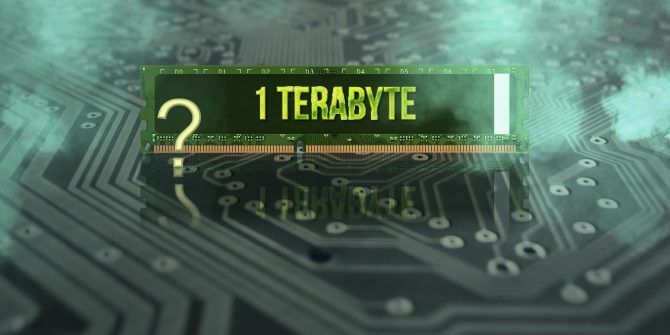 5 Things You Must Know RAM drives might be faster than SSDs, but at what cost? Here's what you need to know before committing to RAM drives all the way. Read More . It’s too bad we won’t have 1TB of RAM available for home use anytime soon. But the good news is, we really don’t need that much. For day-to-day activities, an 8GB system should more than suffice. If you’re a power user, aim for 16GB. To prepare for the future, get 32GB (although we don’t recommend future-proofing PCs 5 Reasons Why You Shouldn't Future-Proof Your PC 5 Reasons Why You Shouldn't Future-Proof Your PC Is future-proofing your PC ever a good idea? Here are several reasons why you might want to reconsider. Read More ). For now, you just need to maximize whatever RAM you already have. For that, see our quick and dirty guide to RAM Everything You Need to Know About RAM & Memory Management Everything You Need to Know About RAM & Memory Management RAM is your computer's short term memory. Hence, memory management has a significant impact on system performance. Here we explain how RAM works and whether you can do anything to increase its efficiency. Read More . You should also know the difference between more RAM and faster RAM Which Is More Important: Faster RAM or More RAM? Which Is More Important: Faster RAM or More RAM? You've narrowed the source of your PC's sluggishness to RAM. What do you do? Increase the amount of RAM? Or would you be better off with faster RAM? It isn't that straightforward. Read More , and which one is more important for you. Meanwhile, you should know what to do if Linux is eating your RAM Is Linux Eating Your RAM? How to Manage Your Memory Is Linux Eating Your RAM? How to Manage Your Memory Why is Linux suddenly running slow? Here's how to check RAM usage and speed things up again on your Linux PC or laptop. Read More . What would you do with 1TB of RAM? Let us know in the comments! Explore more about: Computer Memory, . I just spent the last two days tracking down a bad DIMM in a blade server that's one of six in a cluster. Each DIMM is 64GB and costs (MSRP) $4,200 each... there are 24 of them in each blade. These blades provide a crazy amount of memory space for our distributed databases... the cost of licensing the software for more blades with less RAM has driven us to spend over $60,000 per blade to provide good performance and availability to our customers. These really are beautiful sites to see a fully maxed out blade stuffed with memory that is beyond anything I would have imagined being available much less justified just a few years ago. And yet, here we are... a cluster of servers with 9TB of RAM at the ready. 1TB of RAM would be good for 3D rendering farms... It'd be Real good indeed. For non-server versions available to the public. 32 Bit is limited by 4GB in address space. But 64 Bit has limits imposed coded in Windows. These limits have become much larger. Win 10 Home is 128GB, all other Win 10 is 2TB. Compare that to Win 7 Home Basic is 8GB and Pro and higher is 192GB. Be still my beating heart...now this is something I'd love to see. It's funny that this picture is all over social media, and I see these large 4U servers every day. Heck, we even have the new Gen 9 DL580's here and we have it stuffed with double that amount of RAM. That's right, TWO Terabytes of RAM! We have 30 of them. Opening browser tabs isn't even a thought for their use. I'll just say, a large multi-industrial manufacturing company primarily in the hvac industry with 100,000+ employees :D so we are very large. Mostly used for virtual machines, which is an obvious need for large amounts of RAM. I started my home computer odyssey with an 8 bit Apple II+ with a massive 48 KILOBYTES of RAM. Today I have a PC with a 12 core Xeon on a motherboard that can accommodate up to 32 GIGABYTES of RAM. That PC, while not obsolete yet, is getting close to being obsolete. Considering all the tasks and functions we ask our PCs to perform and the vicious cycle of bigger programs with more features require more memory, which in turn leads to bigger programs with more features which require more memory, etc. etc. etc., it will not be too long before we need 1TB motherboards. Actually, computer clusters have 1TB of RAM and more if you total up the RAM of all the nodes.